Council has followed the recommendation in Bicycle Queensland’s original proposal to provide a 2-way separated bikeway along the northern side of Stanley St between Annerley Rd and Vulture St. I’m certainly looking forward to not having to deal with vehicles turning left through me to enter the hospital driveway on my inbound journey, not to mention people who can’t manage to fully park or unload in the loading zones and short-term parks in front of the hospital, thus pushing me out into the main stream of traffic – which often includes large trucks, and idiots racing to overtake in the left lane. Generally, one-way protected bikelanes on each side of a 2-way street are preferable to a 2-way cycletrack on one side like is proposed here, but in this location I agree that the 2-way design is a sensible choice because it will achieve more within the constraints of the space available. Obviously it will only require the width of one separator (not two), but additionally a 2-way 3.0m wide path will still allow opportunities for cyclists to safely overtake each other wheres a single 1.5m lane between the kerb and a barrier wouldn’t. Ideally, a 2-way bikeway in such a busy location would be wider than 3.0m, and I note that Stanley St already sees 1,200 cycle trips each day, and expect that number to increase dramatically once the cycleway is complete. Although Council is deviating from their normal practice by reducing the general traffic lanes from 3.5m to 3.3m (left lane) and 3.1m (centre lanes), I note that’s still wider than the 3.0m which has been shown to encourage the safest driving behaviour. I’d like to see the width of the bikeway in this section (which caters for both east-bound and south-bound traffic) increased a little to cater for future demand – but not at the expense of the footpath which is very busy in front of the bus station and Brisbane’s major children’s hospital. I am pleased to see that the driveway entrances will be marked up to clearly indicate that drivers must give way to people travelling on the bikeway. I imagine that cyclists riding in bunches in the early mornings and on weekends will often sensibly decide to simply take the left of three general traffic lanes for the inbound trip, rather than cross the road and squash into the protected bikeway. That will almost certainly trigger some people to get outraged at the sight of people on bikes not using the cycleway provided, but instead “hogging” a road lane and somehow hindering drivers who are incapable of switching to one of the other two free lanes. Realistically, some people are just willfully ignorant and that’s unlikely to change, so I suggest: smile, wave and enjoy the ride. Let’s face it, it would be hard to deliberately design an intersection less functional for people travelling by bike than what’s there now, so almost anything would make this intersection better. As I’ve written elsewhere, I was concerned about the light sequence and space at the Vulture St and Dock St crossing which is already insufficient for the numbers of people trying to cross, let alone once inbound bicycle traffic is added to that side. However I have been reassured by the project team that this area will be addressed in the Kangaroo Point Bikeway project, which is intended to be delivered in conjunction with the protected bikeway at this end of Stanley St. 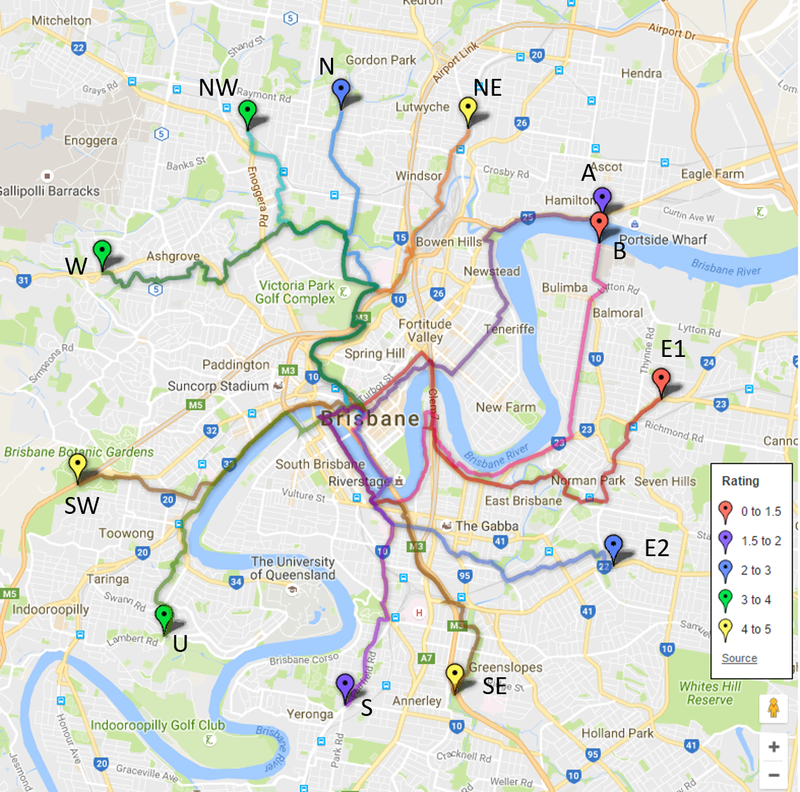 I look forward to seeing the plans for the Kangaroo Point Bikeway within the next few months.